A Muslim teenager who built a clock for a class project won a prize he really didn’t want: a nontransferable invitation to experience a Texas juvenile detention center, handcuffs and all. Ahmed Mohamed, a 14-year-old Irving MacArthur High student, seems to be a pretty smart kid who “makes his own radios and repairs his own go-kart,” according to the Dallas Morning News. 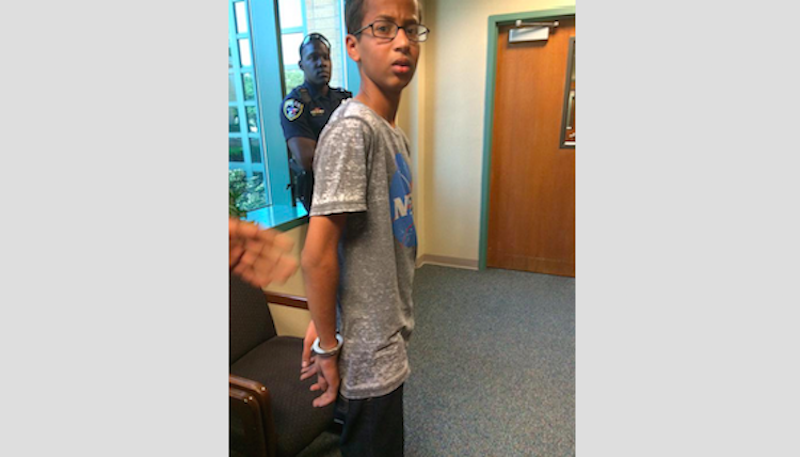 But his latest invention—a clock housed in a pencil case—got him dragged out of school in handcuffs. According to the New York Times, the clock—which he hoped would impress his teachers—“had a digital display, built into a metal case with a circuit board.” But when he showed his English teacher, she called authorities and had him arrested. Responding officers say Mohamed repeatedly explained the device was a clock and although a police spokesperson says the department “had no reason to think it was dangerous,” they’re still suspicious, for reasons they’re having trouble articulating. But officers still did not believe Ahmed was giving them the whole story. “We have no information that he claimed it was a bomb,” Mr. McLellan said. “He kept maintaining it was a clock, but there was no broader explanation. Now the department is doubling down on their mistake, telling the Dallas Morning News they’re debating charging Mohamed with making a hoax bomb—not just because he’s Muslim and they’ve seen an action movie or two, but probably for some other reason they’re holding back from the press due to the sensitive nature of an ongoing investigation, or whatever. Image via Twitter. Contact the author at gabrielle@gawker.com.